This is the first year for legalized betting on the NCAA Tournament outside of Nevada. News, notes, and Vegas Vic’s pick as we wait for Cinderella to emerge. Let’s start with a check of the mailbag. Q: Of the sportsbooks in Pennsylvania, which is most suited to handle a big crowd later this week? Does one have to choose between potential comfort and longer lines for betting? Any help would be appreciated. A: In Southeastern Pennsylvania, I’d recommend Parx in Bensalem. It’s pretty big and has more than two dozen kiosks. Also, there are several viewing options (bars/restaurants) outside of the sportsbook if things get a little tight. One other thing I like is that it also has some kiosks sprinkled throughout the casino floor. I’d expect SugarHouse to be the most energetic, but be prepared for salty language when one guy’s team commits an unforced turnover or bricks a free throw. Still, it’s a good spot with good food choices. Valley Forge Casino Resort is nice, but small. And there are no kiosks, so lines might be an issue given that it opened just last week and the tellers are still getting their feet wet. It’s the only spot with hotels connected. The Radisson is charging $119 a night Thursday-Sunday. The casino tower ranges from $150-$175. If you’re just looking to put a bag down, the Radisson is fine. Parx’s two turf club locations — in Oaks, Pa., and South Philly — have space, but they’re betting parlors as opposed to full-on casinos. The gaming is limited to sports and horses, and the amenities are minimal. But if you’re just looking for action, they’ll have it. Please note that the Flyers have a home game Saturday, which could mean a little heavier traffic for the South Philly turf club. Harrah’s in Chester, like Parx/Bensalem, has a really sharp sportsbook and plenty of places to watch the games. Just depends on which end of I-95 is closest. Me? I’ll be in A.C. for the first two days because I like the option of walking to different places throughout the day. Can’t do that in Pennsylvania. 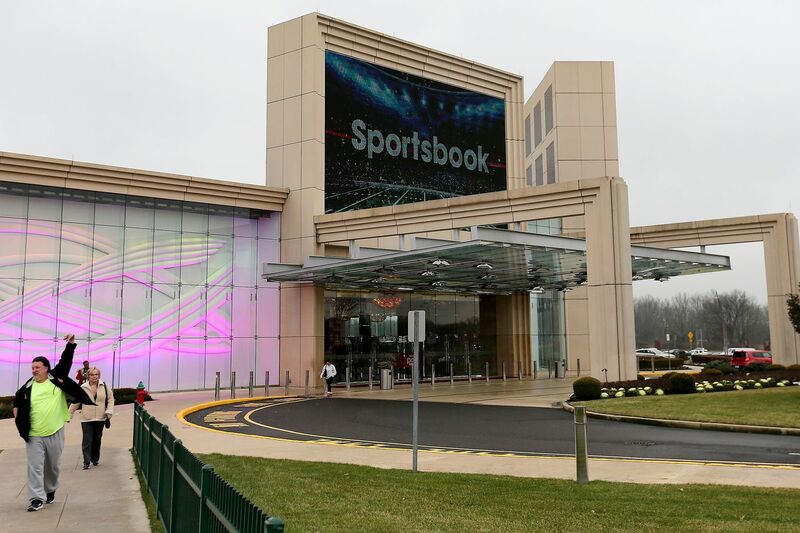 Once you are at one of the sportsbooks here, you have to hop in a car or get an Uber to switch up the luck. The First Four might be televised on truTV, but that doesn’t mean no one will be paying attention. As of Monday, William Hill said 80 percent of the money was going on Belmont. The action at the SugarHouse was predictably the exact opposite. Evan Davis, VP and general counsel for the Delaware Avenue property, says 70 percent of the money-line plays he’s gotten have been on the Owls, as have 66 percent of the bets on the point-spread plays. Both sportsbooks had Temple +3.5 on Tuesday morning, with William Hill (+150) offering a slightly better money line on the Owls than SugarHouse (+143). William Hill has a mobile app in New Jersey as well as retail locations at the Tropicana and Ocean Resort casinos. Mobile betting has not been approved in Pennsylvania. * Bogdanovich said folks are still loading up on Zion Wiliamson and the Fightin’ Krzyzewskis. “Duke is extremely popular in future bets,” he said. “Come game time, we will be rooting against them every time.” The Blue Devils open Friday (7 p.m., CBS) against the winner of NC-Central vs. North Dakota State. * William Hill-US is donating $50,000 to New Jersey’s Council on Compulsive Gambling. Nice gesture. * The Ocean Resort has a special room rate of $99 for the next two Thursday nights, based on availability. It includes a $30 food and beverage credit for the sportsbook, but you have to call 866-50-OCEAN (62326) and ask for the March Madness package. * Westgate in Vegas has set the over/under on No. 1 seeds to reach the Final Four at 1.5. The odds are a little stiff with over at -180 and under +150. The over/under on the highest seed to reach the Final Four is 5.5. Over is +140; under is -160. Villanova is the 6-seed in the South Region. * As of Tuesday morning, no one at SugarHouse was biting on some of the biggest longshots. Davis said all the ML action on Kentucky, Michigan State, North Carolina, Tennessee and Virginia went on the favorites. Duke and Gonzaga are not on this list because their first-round opponents have not been determined. * Betting on college teams based in the state is prohibited in New Jersey, which takes Tuesday night’s first game between Fairleigh Dickinson and Prairie View off the boards in the Garden State. Ditto for Thursday’s Seton Hall-Wofford game. LAS VEGAS -- First Four, Play-In, call it whatever you want, but the Big Dance is on the clock. Looking at the late game tonight in Dayton between Belmont and Temple. Do you wanna make this a conference thing, or, just which team is better? If you’re going conference, the AAC is about 8/9 points better than the Ohio Valley in my Power Ratings; however, we have the Bruins from Nashville a point better than the Owls from Philly. Belmont has done some serious winning since the middle of January, posting 14 Ws in the last 15 games. And the Bruins had a pretty solid spread record, covering 10 of 13, with two games falling on the number. Temple closed strong as well, winning eight of its last 10. Belmont’s overall spread log sits at 18-10-2, a gorgeous 10-4-1 on the road and 15-9-2 as a favorite. The Owls overall spread mark is 15-15-2, 9-7-1 on the road and 6-3-1 as an underdog. If you like over/under totals, the Bruins posted 16 overs and 14 unders, while Temple went 17-14-1 against the over. So, where do we fall? Tiny taste of Fran Dunphy and Temple at +3. In the opener, a light lean toward Prairie View (+1.5) against Fairleigh Dickinson.